"Caught in a pinch for a salad when unexpected company showed up at mealtime, I improvised with this combination. Instantly it became one of my family's favorites. Best of all, it is quick and easy. You can use lemon yogurt instead of strawberry, if you wish." 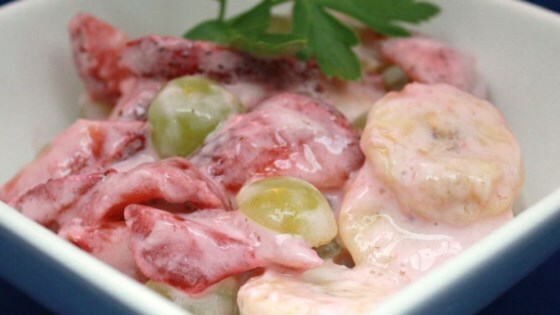 In a large bowl, toss together strawberries, grapes, bananas, and strawberry yogurt. Serve immediately. Really nice fruit combination, but I personally preferred them with vanilla yogurt - I thought the strawberry yogurt tasted weird and artifical with the fresh strawberries. Thanks.